The structure is made portable to achieve a high degree of freedom of location. This, combined with the easy, toolless assembly in minutes, enables you to save expensive anechoic chamber time and to offer on-site sound power diagnostics. The microphone positions are clearly marked to ease the mounting and maintain measurement repeatability. Depending on the size and the emitted acoustic level of the DUT, the hemispheres will allow sound power measurements on everything from small sized personal electrics to office machines and IT products, household appliances, power tools and smaller engines. The only restriction is, that the characteristic dimension of the DUT may be no more than half the measurement radius. 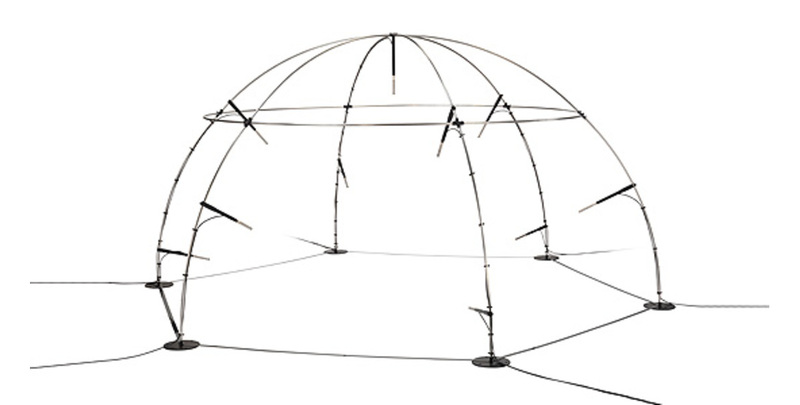 The hemispheres, 1 m or 2 m radius, are available as preconfigured kits with 4, 10 or 20 microphone sets in 3 variations; CCP, LEMO and low-noise LEMO. The microphone sets can be connected directly to all professional measurement systems and are as indicated available for both CCP and 7-pin LEMO inputs. If your system platform supports intelligent transducers according to IEEE 1451.4 (TEDS), the system can be set up to identify the microphone properties and position in the array. All included microphone sets are delivered with individual calibration charts including sensitivity values and frequency responses. These sensitivity values can be used directly in your system setup. For frequent measurement chain verification a reference sound source will be required. GRAS supplies 114 dB types for the standard microphone sets and a special 94 dB adapter for the low-noise sets. Depending on the use and your internal quality control requirements we recommend that the sets are re-calibrated at least every second year. GRAS microphone sets are made of components from our proven standard portfolio and are all manufactured of high-quality material and branded parts that were chosen and processed to ensure life-long stability and robustness. All parts are manufactured and assembled at the factory in Denmark by skilled and dedicated operators in a verified clean-room environment. The microphone diaphragm, body and unique protection grid are made of high-grade stainless steel and make the microphone set resistant to physical damage as well as corrosion caused by aggressive air or gasses. This, together with the enforced gold-plated microphone terminal which guarantees a highly reliable connection, enables us to offer 5 years warranty against defective materials and workmanship. The warranty for cables is 6 months. 1 m CCP Hemisphere kit 4 ch. 1 m CCP Hemisphere kit 10 ch. 1 m CCP Hemisphere kit 20 ch.